Hooray!...This ornament is in stock now! 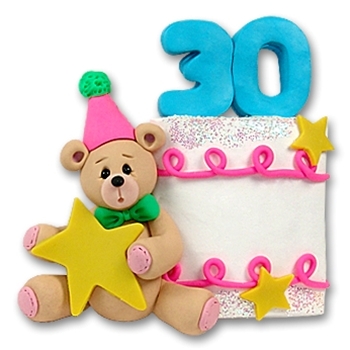 This ornament is part of Deb's Party collection commemorating their 30th year in business! This is the perfect ornament for someone celebrating his or her 30th birthday. It is also a wonderful gift for anyone celebrating a 30th anniversary. It may be easily personalized with a name, year or event As always personalization is FREE! The ornament is lovingly handcrafted from polymer clay and designed by Debi Allison. This ornament does not come in packaging.